Command Authority opening line: The flag of the Union of Soviet Socialist Republics flew high above the Kremlin in a rain shower, a red-and-gold banner waving under a gray sky. 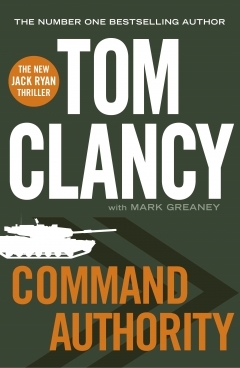 I think everyone in the world who has read a Tom Clancy book must be slightly in love with President Jack Ryan, and now we have his son in the books as well, they are only getting better. Sadly, Tom Clancy has passed away and the fate of the Ryans’ will be left to our imagination. In this book the past and the present become intertwined through a series of events that on the surface to not appear related. President Ryan is of course going to save the world, but it comes at a cost of many lives, one of them nearly being his son. Jack Ryan Jnr proves to be as good an analyst as his father was, and it is his tenacity that leads to a successful outcome and peace in a region currently in the news. I love that my hobby is sponsored by Penguin Books South Africa and I am ever grateful for the fact that they have chosen me to be one of their reviewers. I just wish I could get paid to be a proof reader. There is a grammar error on page 524 that I picked up easily, and I wonder how in the modern age, a computer does not ‘see’ this. he realized why he and Eastling and (instead of had) been ushered in. You don’t need to have read any of the past books to make this a good read, and I love the writing and the way with words that Clancy imbues to his books. I can recommend that you rush out and get yourself a copy of this magnificent book. Congratulations!!! And thank you for all the recommendations, I do read them and it’s helpful. Love that you can pick it up without having read the previous novels.